China, the world’s fastest-growing commercial aviation market, is poised to see its airline industry generate greater revenue as more carriers provide e-commerce services to passengers over their in-flight broadband systems. The mainland, which has the world’s largest smartphone and online retail markets, is predicted to corner a considerable share of the estimated US$130 billion of global in-flight broadband-enabled ancillary revenue forecast for airlines by 2035. “We can expect to see significant growth in China because passengers prefer to bring their personal electronic devices on board to access their choice of content and services, as they would enjoy on the ground,” Otto Gergye, the vice-president for Asia-Pacific at British satellite telecommunications company Inmarsat, told the South China Morning Post on Thursday. His comments followed the release on Wednesday of a research study on the emerging in-flight market segment, Sky High Economics, by the London School of Economics and Political Science in association with Inmarsat. Airlines in Asia-Pacific can expect to see the greatest opportunity from in-flight broadband-enabled ancillary services, with total revenue projected to reach US$10.3 billion on the back of passenger growth and wide availability of such services, according to the study. Revenue would come from broadband access fees, advertising, so-called premium content and e-commerce sales arrangements with companies such as JD.com and Alibaba Group Holding. New York-listed Alibaba owns the Post. The study estimated airlines around the world currently receive, on average, an additional US$17 per passenger from traditional ancillary services, such as duty free buys and in-flight retail, food and drink sales. 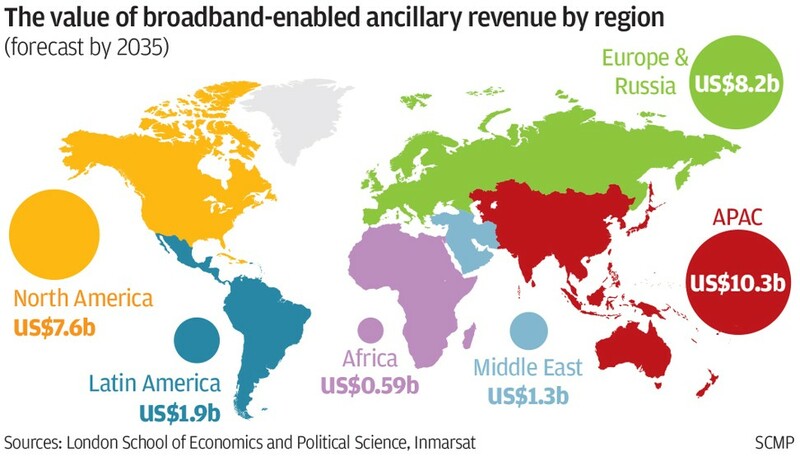 In-flight broadband-enabled ancillary revenues would add an extra US$4 by 2035, it said. “Globally, if airlines can provide a reliable broadband connection, it will be the catalyst for rolling out more creative advertising, content and e-commerce packages,” said Alexander Grous, the author of the study. A recent global survey of 9,000 airline passengers from 18 countries conducted by market research firm GfK and Inmarsat found 68 per cent of passengers in China ranked in-flight connectivity as more important than in-flight entertainment. The survey also found the mainland airline likely to lead in providing in-flight Wi-fi services is Beijing-based national flag-carrier Air China, according to 46 per cent of respondents. It was followed by China Eastern Airlines, headquartered in Shanghai, and Guangzhou-based China Southern Airlines. “The major airlines in China have already struck strategic partnerships with the country’s largest online retailers, such as JD.com and Alibaba Group, to serve their passengers,” Gergye said. Such demand is fuelled by how mainland consumers are more accustomed to using the internet than anywhere in the world, with 731 million users at the end of December last year, according to the China internet Network Information Centre. Of that number, 695 million people access the internet on their smartphones. Online shopping has also remained buoyant on the mainland, despite a slowdown in the domestic economy. The country’s online retail market is predicted to grow to US$1.7 trillion by 2020, compared with US$750 billion last year, according to a report from Goldman Sachs. “There’s no doubt that in-flight broadband will revolutionise the way we work, play and consume content whilst in the air,” said Paul Haswell, a partner at international law firm Pinsent Masons. At present, only 53 out of an estimated 5,000 airlines worldwide offer in-flight broadband connectivity, the study said. China is forecast to record a total of 1.3 billion passengers flying to, from and within the country by 2035, according to a forecast made last year by trade group the International Air Transport Association.